The Ezi-action® Safety Measure is being chosen in UK and Europe for its closed delivery dispensing and ease of fitting to all Ezi-action® Drumpumps. Brilliant for the safe, responsible decanting and delivery of harsh chemicals. Equally suitable for liquid foods. 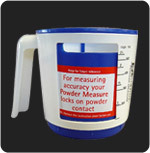 Dramatically reduces the likelihood that hazardous chemicals will come into contact with the operator. 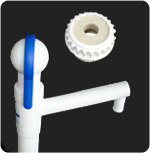 The two way calibrated bottle is uniquely designed to fit the Ezi-action® Drum Pump. 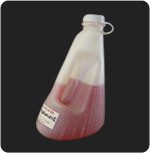 Provides totally closed delivery of a chemical from a barrel or container. Bayonet Twist-on Spout provides secure fit of the Ezi-action® Safety Measure to the Ezi-action® Drumpump. 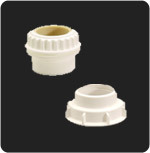 White screw cap is always attached to the neck of the Ezi-action® Safety Measure. Dangerous fumes and liquids are contained when being transported in a closed Ezi-action® Safety Measure. Label for clear identification of contents and prevention of chemical mix-ups. Red and blue screw caps available. Click here to learn more. The Ezi-action® Safety Measure can be easily stored by clicking back onto the spout of the Ezi-action® Drumpump. Unique patented two way calibration system enables quantity of liquid being poured out to be read when the Ezi-action® Safety Measure is tilted on its side and when standing. Filling of the Ezi-action® Safety Measure bottle is easily controlled by the speed of pumping the Ezi-action® Drumpump. The Ezi-action® Safety Measure bottle can hold up to a litre. Made from FDA approved plastics. 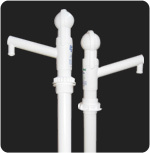 As a general guide on chemical resistance refer to the Compatibility Guide for HDPE. Available fitted to the Ezi-action® Drumpump or as Ezi-action® Safety Measure Kit. Conversion using the Ezi-action® Safety Measure Kit is easy. 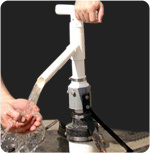 Pull off the straight spout of your Ezi-action® Drumpump and push on the unique Safety Measure Spout supplied in the Kit. Our sales team will respond quickly to all genuine interest. Guaranteed.